With arranged marriages at the age of 21, the only exception is to prove to the world that love can overcome your greatest temptation. One domain ... One accord ... One nation. That is the moral code. In Cali&apos;s eyes, it all revolves around a twisted plot for control. It used to sicken Cali how people would allow the Regime to test their love through the Temptation Trials. That is, until she met Kincade. Cali&apos;s entire point of view changes when she falls for him. She struggles with herself, debating if she should challenge the government&apos;s law of arranged marriage. Cali&apos;s childhood friend, Stefani, always kept a positive perspective about their lives until she was threatened with the same dilemma, at odds over the man she loves. Now Cali and Stefani face a desperate choice--submit to the Regime&apos;s will, or fight for what they value most--love. Although lust, mistaken for love, could lead to damnation. Do they give up on love or sign up for the Temptation Trials, a reality TV show where every temptation is laid before them? Adult, Dystopian, Romance with sensuality, sexual content, and love triangles. Is 2036 and a dictator has taken over the world. There is a one world order with the excuse of maintaining peace. The regime arranges marriages when people turn 21. The only way people can marry who they love is by entering the Temptation Trials: a reality show in which couples are tempted with other people. Stephanie and Cali fall in love with Tobias and Cade respectively. 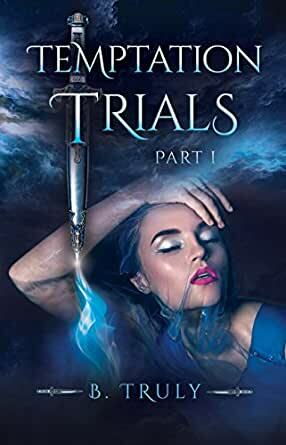 Both couples decide to fight for their love in the Temptation Trials. Will they be able to overcome temptation? Will they succumb to seduction? However, there is much more than meets the eye about the Temptation Trials and the one world order. When the truth comes to light, the couples will have to fight for much more than love. Temptation Trials (Part 1) was an entertaining and juicy read. I thought the plot was interesting for an erotica novel. I did not like that the characters speak in slang, but it does not detract the reader from enjoying the story. I recommend this book to those who enjoy erotica and dystopian novels. That's me while reading this. I have never read a dystopian tale like this before! After World War III, a world-wide dictator has come to power. In this bleak future the people aren't allowed to make the most important decision in their lives--who to love. At age 21 the government matches you with whomever they feel will suit you best. If that person is on another continent, you pick up and go, leaving family and friends behind. There is only one way to avoid an arranged marriage--agree to go on a government-sponsored reality television show called the Temptation Trials. The couples are separated. The guys go to one island, the girls to another. Each island is filled with beautiful and seductive people whose sole purpose is to tempt the contestants to be unfaithful. This tale is told through alternating viewpoints of Stef and Cali. They have met and fallen in love with two terrific guys, Tobias and Kincade, respectively. With their twenty-first birthday rapidly approaching, they know their only shot at staying together is to go on the Trials. It should be simple to resist infidelity if you truly love your soul-bound. (That's what they call their soulmates.) But in the five seasons the show has been on, not a single couple has stuck together. They weren't expecting the raging out-of-control hormones and a lust so powerful it makes the contestants lose all sense of propriety. Morals are thrown out the window. I won't give any spoilers, but there is a nefarious reason no one can keep it in their pants. I liked both the women. Their boyfriends and the two island tempters are great too. It was hard to make up my mind who to root for. By the end of the story, the women and the island tempters realize they have all been played. Can love save their souls? Not likely. They learn you can't sin your way to righteousness, and doing the "right" thing the "wrong way" never works out. I threw everything into the kiss, not knowing if it would be our last, or are future. The story ends in a cliffy. B, hurry up and publish the next installment. I'm reviewing this book as a participant in the Goodreads group, Lovers of Paranormal R2R program. It took me a while to read this book because simply put, the writing style was like nails on a chalkboard to my brain...LOL I like a little more description (not too much! That's worse) But I found it grating that people and places were not adequately described. It meant that my imagination was left to fill in the holes, which is good at times but not all the time.